- Direct From the KING of Creating Your Own Reality! PLUS: What the 24 "Secret" Teachers REALLY Think! We cannot guarantee that this product will work for you. But if you're not completely happy with the results, just let us know within 90 days and we'll refund your order. No strings attached. You've tried MANIFESTING – but it just didn’t work out as you planned. YES - You should be a Manifestation Master by now. And I’ll bet that you’ve definitely had some success so far. But it’s NOWHERE NEAR where you’d like to be. Well, you’re not alone. Because despite their popularity, these mass-produced DVDs and books don’t reveal the whole secret behind manifestation. Although it brought many self-help teachers to the public eye, many of it’s 24 featured experts have complained that it was simply the result of good editing. Fred Alan Wolf, for instance, one of the biggest stars of the film, publicly stated that he didn’t even believe in the Law of Attraction – and that the film simply uses pseudo-quantum physics to sell the concept. Esther Hicks requested to be edited out, following disputes over marketing tactics. James Ray didn’t get chance to explain WHY it took him NINE YEARS to manifest his appearance on Oprah, and what he'd do differently now. And the producers only lightly touched on one of Joe Vitale’s most critical ideas. And how about the one teacher in The Secret who only appeared for five seconds throughout the entire film – yet had the greatest secret to share? In fact, one-third of the teachers are direct customers of this individual’s secret technique. Forget fancy graphics. Forget gurus and pseudo-science. Forget DVDs. How can you GENUINELY and PRACTICALLY begin manifesting ANYTHING you want in life – STARTING TONIGHT? It’s more amazing that even The Secret knows. WITHIN MINUTES, you can genuinely manifest a new car, a new house, a stress-free life, a soul mate, a new social circle, support with weight loss – ANYTHING YOU DESIRE. Here’s Who I Am – And Why You Should Care! He Convinced Me to Put My Thoughts Into Words. My name is Bradley Thompson – and I’ve been using the power of manifestation for the past twenty years, before it was even called manifestation! I’m the author of a whole bundle of best-selling books, including “Be Psychic”, “Building Your Own Subliminal-Studio” and “Lucid Dreaming in Seven Days.” I also helped produce award-winning personal development tools such as Motivator and Subliminal Power, currently used by over a million individuals throughout the globe. You can learn more about my products here. Over the past twenty years, I’ve manifested a true dream life. I’ve manifested my own “home castle” just below Scotland. I’ve manifested a business currently worth almost seven million pounds. (Yes, pounds: I live in the UK – though most of my work is with the States). I’ve manifested dozens of products which bear my name. I’ve manifested a fantastic bunch of friends. I even manifested my perfect partner, Jane – some fifteen years ago. Twenty years ago, I discovered The REAL Secret. I studied many of the manifestation guides from the late 1800’s, when they didn’t have snappy “ancient wisdom” DVD graphics to keep viewers entertained. I soon found a SIMPLE six-step technique for manifesting absolutely ANYTHING – quickly. You’ll find some of these steps inside The Secret . But it’s missing two of the MOST CRITICAL steps – and those little-known steps are what’s stopping The Secret fully working for YOU. Discovered The Secret BEHIND The Secret! I’m sitting in The Landmark hotel in London. My publisher is sat opposite. His name is Tim Raeburn, and he works for the Self Development Network. These simple words were the inspiration behind this entire site. “What’s not working?” I asked. Tim pulls a funny face – and I smile. I love his sense of humor. “How are you doing it?” I ask – and he explains. He was trying everything recommended in The Secret – yet due to bad editing and marketing hype, was missing the TWO MOST IMPORTANT STEPS in the entire process! I went home immediately and began to research. I watched the movie over and over. And I compared it with my own personal technique – a technique I’ve created and shared over the past twenty years. A technique for manifesting ANYTHING in just six easy steps. A technique that has NEVER FAILED ME. I sent my notes off to Tim a week later. He was desperately trying to manifest a brand new car, and his soul partner. >> This past week has been the craziest of my life!! >> I tried your two extra steps and WOW, what a difference. We’ve taken on a new client, M******** UK Ltd, and I went to visit them in Richmond. >> Within the space of a week, the guys there have become my new best friends. I’ve an entire fresh social circle. AND they just set me up with the funniest, wittiest girl I’ve ever met. >> We went on our first date last night – and WOW. I am just smitten. >> Not only that, I received a HUGE mid-year bonus last month, because of performance. I’m going to buy that new car THIS WEEKEND. >> You’re just the most inspirational guy I’ve ever worked with. Do YOU want to know what Tim knows? Well, Tim wants you to know. In fact, he wanted you to know so much that he immediately begged me to write a brand new course on the topic – AND create a program to help people understand the concept. So, I manifested it – and that’s why you’re here today. With This SECRET Recipe Book for the Universe! My publishers demanded a LOT. They wanted me to share my own unique manifestation method with the world. They wanted all of the details – in the most practical method possible. NO hype. NO pseudo-science. NO bull. Just the real-life rules of manifestation. Techniques that YOU can use that will gain you results – STARTING TODAY. Yes, I was hesitant – but when I realized SO MANY people were achieving SO LITTLE using methods in The Secret, I put finger to keyboard. I wanted to create a book that unveiled EVERY TRIED & TESTED SECRET I’ve ever used to manifest great things in my life. I lifted the veil on my previously unpublished SIX-PART manifestation method – something I’ve used for the past twenty years, WITHOUT FAIL. I even made public the REAL SCIENCE behind manifestation – not the mumbo-jumbo you’ll find on dumbed-down DVDs. This is stuff you WON’T find ANYWHERE ELSE. Want to discover just A FEW of the HUGE manifestation secrets crammed inside the 140+ pages of “The Quantum Cookbook”? Discover the REAL SCIENCE behind manifesting: Yes, quantum physics is important, but What the Bleep doesn’t tell you the whole truth! How to get in touch with your own PERSONAL WISHING GENIE: Ask for what you want and watch as it gets delivered! Creating a MANIFESTATION RITUAL – Here’s exactly what you need to know and how to do it! The SECRET TWO MANIFESTATION TECHNIQUES that most courses don’t cover – And WHY this means you’re only getting half-hearted results right now! What manifesting REALLY IS, what’s actually happening – and the SIX STEPS to guaranteeing it works for you, FIRST TIME, EVERY TIME! The TEN PRINCIPLES of MANIFESTATION – Follow these to succeed quicker than ANYONE ELSE. Includes three you’ve probably never even thought of! The LG secret to success – MISS THIS and you’ll miss out. It’s Joe Vitale’s little secret and it’s CRUCIAL! Is everything REALLY connected to everything else? Or is the theory flawed? Read the absolute, unbiased FACTS – and discover the potentially-shocking TRUTH! Why BABUSHKA DOLLS hold the secret to “rewiring” our internal manifestation processes – and the one quote from What the Bleep that everybody hears, but no-one really understands! Why you should NEVER WANT the things you manifest! It sounds paradoxical, but DO THIS and you might as well THROW AWAY the whole experience! The “EMPTY SPACE” in the world – And why this is the REAL SECRET FOUNDATION of manifestation magic! The SIX POWERFUL QUESTIONS you absolutely MUST ask yourself during each manifestation session! The FIVE PRIORITY AREAS of your life that you MUST focus on before dealing with anything else. Don’t get these wrong, or you’ll ruin everything! The SIX SECRET “INGREDIENTS” to manifestation – Just follow my recipe for success manifesting, EVERY SINGLE DAY! Find out EXACTLY what you DON’T WANT – And the things you should NEVER, EVER MANIFEST – EVER! MANIFEST your SOUL MATE! Here’s the EXACT technique I used to attract my soul mate and wife, Jane! Follow these steps and prepare for romance! Should you tell people that you’re manifesting? The answer is CRITICAL. Learn what you SHOULD and SHOULDN’T tell people! The MANIFESTATION RECIPE SHEET – Just fill it out, bake for twenty minutes, and watch your dreams come true! How you can use MUSIC to TURBOCHARGE your manifestation! It’s not the advice you’d imagine, and this one will DEFINITELY surprise you! I use this little trick EVERY TIME, with COMPLETE success! Portable MANIFESTATION RECIPE CARDS, to ensure your manifestation is ALWAYS at hand. Just print and follow the six steps anytime! REAL LIFE MANIFESTATION STORIES – Read these and find out what you’ve been missing. Then get manifesting, join in the FUN, and get ahead of the crowd! You’ll learn all of these secrets inside The Quantum Cookbook. Remember, manifesting is INCREDIBLY EASY to get started with, but you absolutely MUST use the right techniques. I’ll share the PRECISE METHOD with you. Get it wrong and you’re just WASTING your time. If you’ve ever FELT like you’re wasting your time with manifestation, then this is definitely the guide for you. But I have even MORE in store for the powerful individuals that want to discover the Quantum Cookbook. If YOU purchase The Quantum Cookbook, I have TWO BONUS audio sessions that I’m going to give you – PLUS a whole BUNDLE of bonus interviews with the BIG STARS of The Secret. PLUS: Discover the TWO BONUS audio sessions with the Course! Including the 30-Minute Quantum Cookbook Overview - AND the Step-by-Step Manifestation Session! So, you want to begin manifesting – NOW? Manifestation is perhaps one of the easiest tricks in the world. And not everybody wants to read a full course on how it works before they get started. Most don’t care about the science. They just want to see results. - INCLUDING my POWERFUL SIX-STEP MANIFESTATION METHOD! Want to get started QUICKLY? Then skip the book and just listen to this audio session. It contains ALL you need to get started, in just half-an-hour. From the science to creating your own daily manifestation ritual, it’s all within this program! If you’re anything like me, you’ll know that it’s easy to become confused when you’re given a whole series of steps to follow. Sometimes it’s easier just to HAVE someone there to guide you through the entire process. That’s why I’ve ALSO created The Quantum Cookbook “Guided Manifestation Session” – where I literally guide you through an ENTIRE manifestation session! - And you’ll be CLOSER to your goal! This is the ULTIMATE manifestation companion – and this is THE FIRST TIME that a guided manifestation program has EVER been created. So, leave the hard work to me – and listen as I guide you through the simple process of manifesting. It’s EASY. All YOU have to do is sit back – and REAP the REWARDS! You’ll receive BOTH of these bonus programs if you grab your copy The Quantum Cookbook – TODAY. “The Secret” - Absolutely FREE of CHARGE! Would YOU like to discover what the big stars of The Secret really believe? Both “The Secret” and “What the Bleep Do We Know” have attracted major criticism. The films are mass-produced and omit critical information. In fact, “What the Bleep! ?” contains pages of factual errors – all listed on Wikipedia. What do the stars of these films REALLY believe? FRED ALAN WOLF – The big star of The Secret AND What the Bleep! Listen as Fred gives the lowdown on why the Law of Attraction simply is NOT POSSIBLE. This is critical – but Fred provides an alternative theory which describes why manifestation really can work. You MUST hear this! JAMES ARTHUR RAY – The multi-millionaire star of Larry King Live and Oprah (twice!) chats about how The Secret MISSED OUT the CRITICAL manifestation laws of success. He unveils how he manifested his place on Oprah (and why it took him SO LONG), and using “harmony” to turbocharge your manifesting! JOE VITALE – The #1 best-selling author and star of The Secret and Larry King Live discusses how we’re all creating our own reality – even the very worst parts of it. Joe unveils how to get out of a rut, and the SINGLE SECRET most people misunderstand when it comes to manifesting! Listen as each of these guests is interviewed for OVER AN HOUR EACH - and as they share honest and POWERFUL information about the manifestation process, including THE REAL SECRETS that never made it to the commercial DVDs! These interviews will change your perspective completely – ESPECIALLY the ones with Fred Alan Wolf and Hale Dwoskin. Do NOT miss these two. All of these interviews are included when YOU purchase The Quantum Cookbook. So, are YOU ready to STOP MISSING OUT – and START MANIFESTING? 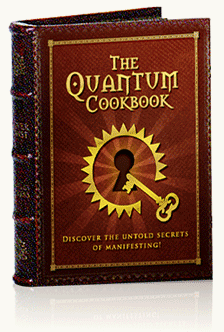 IF the answer is yes, then the time is right for you to discover The Quantum Cookbook kit. Decide to Order YOUR Copy of The Quantum Cookbook! This is your chance to make a decision. Is NOW your time to let go of “pseudo-manifesting” – and discover how to REALLY tap into the secrets of manifestation? Yes, you’ve had some success so far. But it hasn’t taken you far enough. This is your chance to find out WHY. And to take everything to the NEXT LEVEL – ONLY with The Quantum Cookbook and all of it’s bonuses. 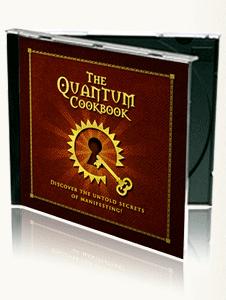 The Entire Quantum Cookbook – Discover the true secrets of creating your own reality! The Quantum Cookbook Microwave Session – Everything you need to know to get started with manifesting, in just 30 minutes flat! The Manifestation Session – Want to manifest? Just slip on your headphones and hit the play button! Four Interviews with the Big Stars of The Secret – Well-respected stars of The Secret, What the Bleep, Oprah and Larry King Live unveil exactly what was missing in “The Secret”. How much will this entire experience cost? APRIL UPDATE: As part of our SPECIAL April marketing promotion, we’re SLASHING the price of The Quantum Cookbook kit down from $397 down to JUST $197 --- JUST $147. This is the CHEAPEST we’ve EVER offered the entire Quantum Cookbook course. There’s literally NEVER been a better time to grab your copy. To begin your manifestation adventure, and start creating magic in YOUR life, then click on this link – and let’s get started! NOT SURE? Click HERE to view our many unsolicited testimonials. PLUS: Try Out The Quantum Cookbook for 3 Months! AND Give You Another $150 Just to Say Thanks! Here’s a deal you don’t see very often. I want to make trying out The Quantum Cookbook and it’s bonus items as EASY as possible for you. That’s why I’d like to offer you the following guarantee, certified and backed by my publishers, the Self Development Network. I want to make sure that you’ll be ABSOLUTELY THRILLED with the entire Quantum Cookbook course. Then just TRY IT OUT. If you’re not totally AWE-STRUCK by The Quantum Cookbook and it’s methods – then just RETURN the entire package after three months (and within six) and we’ll refund your full purchase price, minus our original S&H. We’ll also give you $150 in vouchers to use against ANY product in the Self Development Network range. Which includes dozens of powerful self-development tools and many other products. That’s a pretty good MONEY-BACK GUARANTEE. Not many companies offer that. I’m serious about The Quantum Cookbook. Why not try it yourself – and see JUST what you’re missing out on? Are YOU ready to stop just talking about manifesting – and actually begin manifesting some AMAZING RESULTS in your life? No matter WHAT you want, YOU have the power to obtain it. Remember, try it out for three whole months. I’ll pay YOU $150 if you’re not completely thrilled. If you’re even SLIGHTLY unsure, then I’d like to invite you to read the totally unsolicited testimonials we’ve received this month alone – by clicking here. I know you’ll be amazed. Get ready for MANIFESTATION SUCCESS! PS. The Quantum Cookbook is exclusive to this site! That’s right. You absolutely CANNOT buy this course, or any of it’s bonuses, in ANY store – or anywhere else on the Internet. It’s ONLY available here. So if you want to begin discovering the REAL secrets of manifesting, without the hype – then you’re lucky to have found just the right place. Click here to get started! PPS. Remember my 200+% MONEY-BACK guarantee! Try out the entire program for three whole months. If you’re not thrilled, return it within six months for a full refund – AND I’ll give you $150 of self-development vouchers just to say thanks for trying it out! Home | Testimonials | Affiliates | Contact | BUY NOW!